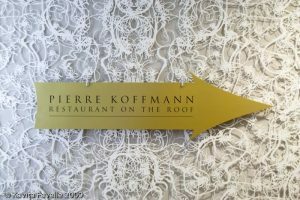 When I first heard about Pierre Koffmann’s pop-up restaurant I was very excited! 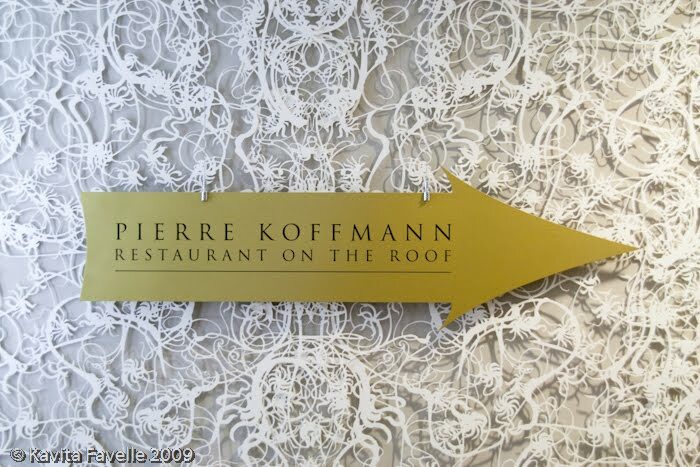 Koffmann is a living legend and, as part of the London Restaurant Festival, he is running a restaurant on the roof of Selfridges. 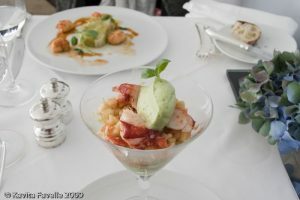 Having never dined at La Tante Claire, I was really keen not to miss out. Unfortunately, the festival week coincides squarely with a long-arranged overseas trip and I could only attend a single date of those initially on offer. (The pop-up has now been extended to the end of October, and it seems extremely likely it will be extended further). Imagine my delight when I secured a lunch reservation for 2 on the first day of opening. And then an entire month of anticipation and salivation which culminated in my glorious meal today. As Pete wasn’t able to come with me, I offered a fellow food-lover friend, Jennifer of Chocolate Ecstasy Tours, the second place and we met, giddy with expectation and hunger, outside the famous department store. 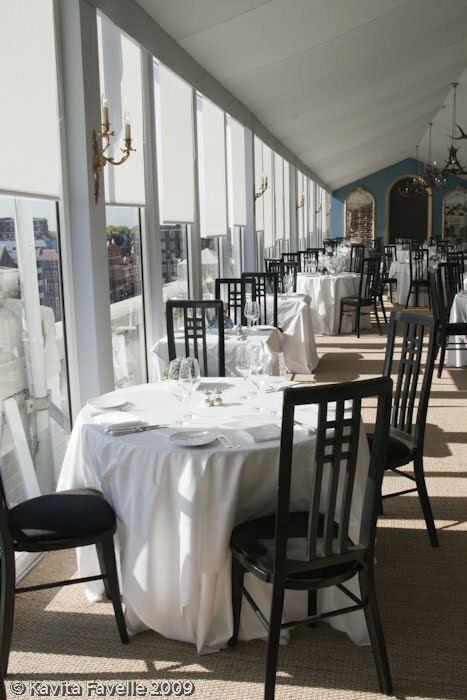 With a noon booking, we were amongst the first to arrive, and it took us a few moments to find the dedicated lift up to the roof restaurant. The doors opened to a winter grotto scene with a beautiful white light sculpture and corridor leading through to a reception area, then up into the large marquee. If you’re feeling nervous about the marquee element, fret no further. This is a marquee in name and shape only; solidly built, beautifully decorated and with not a breeze of cold October air, it’s warm and cosy and elegant. The dining space is charming. Tables are generously spaced out and elegantly dressed. The windows let in lots of light. 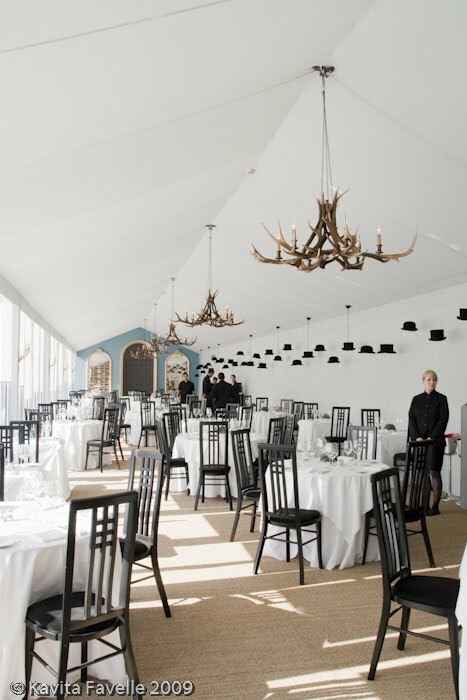 From the apex of the high marquee ceiling hang quirky antler chandeliers, like those in The Bull & Last pub in Highgate. And along the length of the inside wall hang black top and bowler hats, some converted to lightshades. 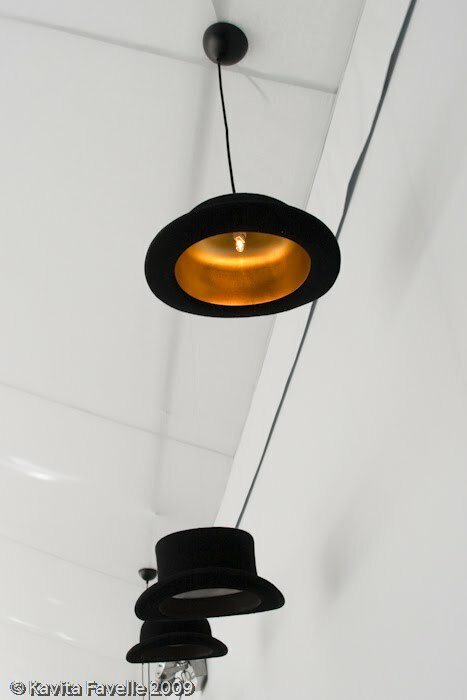 A fun space with a nice balance between traditional and innovative. 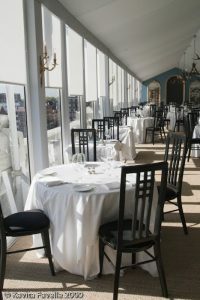 Initially seated by the huge windows, with views over London, we quickly switched to a table against the opposite wall; much cooler than the window seat and still with terrific views. Menus handed out, we got down to the important business of choosing and placed our orders. Budget-conscious, I opted for tap water, which was courteously provided. Jen also had a glass of white wine from a wine list with a surprising number of very reasonably priced options. The bread basket offered freshly baked (and still warm), mini baguette, plain white or tomato. While we were enjoying this, the amuse bouche arrived. 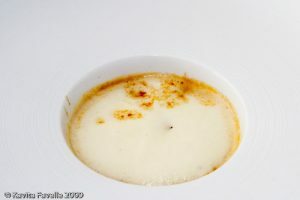 Langoustine bisque with potato foam was absolutely packed with flavour. The foam was quite surprising, providing a really clear potato taste without the usual heavy texture. A lovely start and both Jen and I mopped up every last drop with our bread; sod couth, who needs couth?! My starter Cocktail of Scottish Lobster and Avocado with a Lemon Jelly was served in a martini glass and looked spectacular. And wow, it tasted fantastic too. 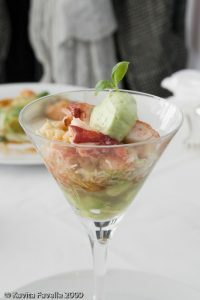 As well as generous, perfectly cooked chunks of lobster and fresh avocado, I found little pieces of sharp lemon jelly, a light crispy salad and tiny cubes of apple, all pulled together with a light dressing. The avocado mousse on top was also a tasty addition. I savoured every single mouthful! Jen’s starter of Pressed Leeks and Langoustines with a Truffle Vinaigrette was also striking and satisfyingly generous, too. 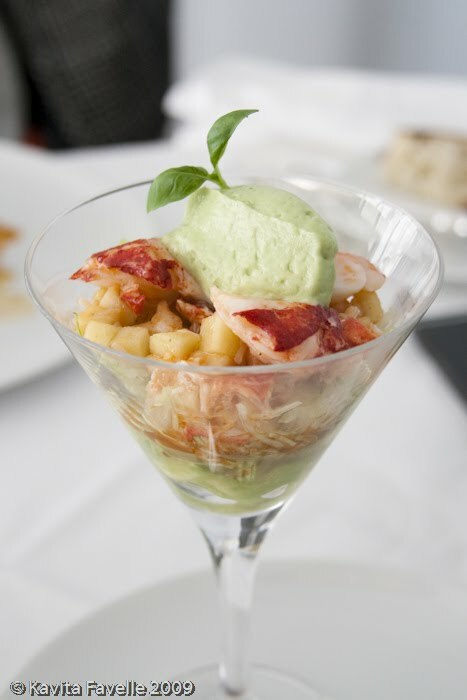 It was simple, yet beautifully executed with a lovely flavour in the langoustine sauce. It seemed less exciting than mine on first glance but was actually very delicious. Jen’s Pavè of Wild Seabass with an Artichoke Barigoule was a beautiful piece of fish. 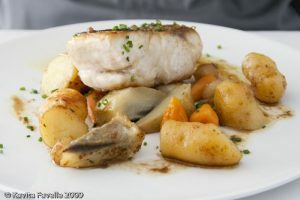 Again, the portion was generous and the fish was nicely cooked. With it were some very tasty potatoes – we asked about them and one of the staff headed off to check with the kitchen, and returned to tell us that they hadn’t been sure until the last minute whether they’d be able to get this variety, called corne de gatte and grown in France, but were very pleased they did – google shows me these are simply pink fir apple potatoes. Slow-cooked garlic and tiny onions/ shallots were beautifully sweet, carrots fresh and light. The artichoke, I wasn’t as keen on, but Jen enjoyed it. I was quite nervous about Pig’s Trotter stuffed with Veal Sweetbreads and Morel Mushrooms. I’ve enjoyed sweetbreads before but never eaten trotter and had no idea whether I’d like it. But it’s a dish so strongly associated with Koffmann that I just couldn’t miss the opportunity to try it. Luckily, I liked it! Not a dish for the diet-conscious, the sweetbreads and mushrooms were wrapped in the thick, gelatinous fat of the trotter. I had expected some crispness to the skin but instead it was more like slow-braised pork belly fat. Unctuous and silky. It was served with an extremely good mash, two beautiful, paper-thin bacon wheels and a thick, savoury sauce. By this point we were both feeling quite full but of course, we ploughed on and ordered desserts! Jen chose the Gascon Apple Pie. Wow, what a fabulous dessert! Thin, strong crunchy pastry sheets formed a thick base beneath the apple and then a protective lid of wildly folding flaps, above. Beneath the apple, they formed into a thick, chewy, crispy, caramel-infused layer of heaven! The apples were soft but with just enough firmness to retain their shape. And the caramel sauce was marvellous. Whilst we were eating, an elegant lady who we think is perhaps Pierre’s partner/wife, Claire, came over to tell us about the very special flour used for the croustade pastry and also how, on a recent holiday, Pierre had eaten this dessert every single day! We could understand why! 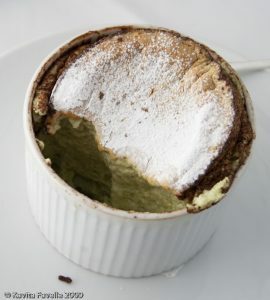 I went for the Pistachio Soufflé with Pistachio Ice Cream and was not disappointed. Whilst the ice cream was nothing to write home about, the soufflé was a revelation and the second really fabulous dessert souffle I’ve had in the last few weeks. Beautifully risen, dusted with chocolate and icing sugar, fluffy inside, with a smooth and creamy pistachio taste it was just magnificent. I didn’t really have room to finish it but I did anyway! 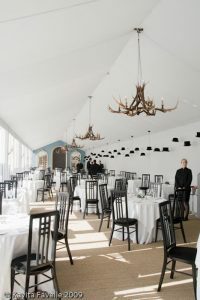 We wondered at this point whether we’d soon be rushed on, as the two hour turnaround time had been stressed to me both on making the reservation and when they called to re-confirm yesterday. Service had been very warm and friendly, but a little haphazard and it was already gone two o’clock, the time we should have left. But there were other tables free and we went ahead and ordered mint tea. To our surprise, no petit fours were served with it, though Jen knew from her contacts that some had been made, so we asked and a plate was quickly bought out to us. 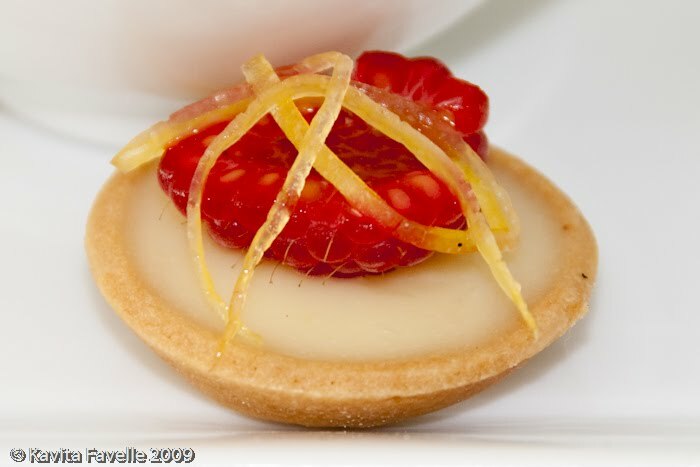 William Curley chocolates, a little lemon and raspberry tart, some nougat, a sesame crisp, a pate de fruit and a miniature loaf cake infused, we think, with rum – this was a generous plate. Can you believe, I was so full I could not even eat my share, though I did try everything! By half past two we flagged down one of the ladies who seemed to be in charge – I think it may have been the same Dawn who managed early reservations – and asked whether it might be possible to have a copy of the menu each, signed by Pierre and by Eric Chavot, working with him in the kitchen. This was very kindly arranged and we were as pleased as punch with our lovely mementos. What a truly wonderful experience! I know many of my food-loving friends are visiting over the next couple of weeks; I hope you have as lovely a meal as we did! 31 Comments to "Pierre Koffmann’s Pop-Up Restaurant at Selfridges"
Wasn't it today you went? And there's already a review? Fast work, I'm impressed. Sounds like you guys had an excellent lunch. Langoustine and lobster I can always eat, though I would probably also have felt a little nervous about the trotters to start off with! Oooh! Really looking forward to Sunday now, and I've pretty much decided on exactly the same dishes you had! Lovely post – thanks for sharing! Thanks for getting the post up so quickly, you've really whetted my appetite for going on Saturday night. Think i'm going to have to try the pigs trotters. Was the entire menu a la carte and how much is it going to set me back?! It was £75 and there were 5 choices for each course. Helen, yes it was today but I know lots of people are going so I thought it would be nice to be able to give my feedback as quickly as possible so it is still relevant! 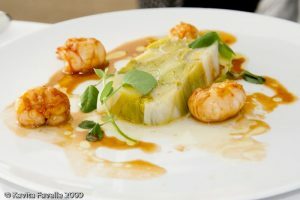 Looks like a wonderful meal; well written review and some great pictures. How much did the meal cost? £75 for the set menu, just a few pounds more for the wine and mint teas, we paid this on card. And left a tip in cash. I read in the evening standard that there are no vegetarian options – is this right? we are taking a vegetarian and dont want to miss out! Kavey!! 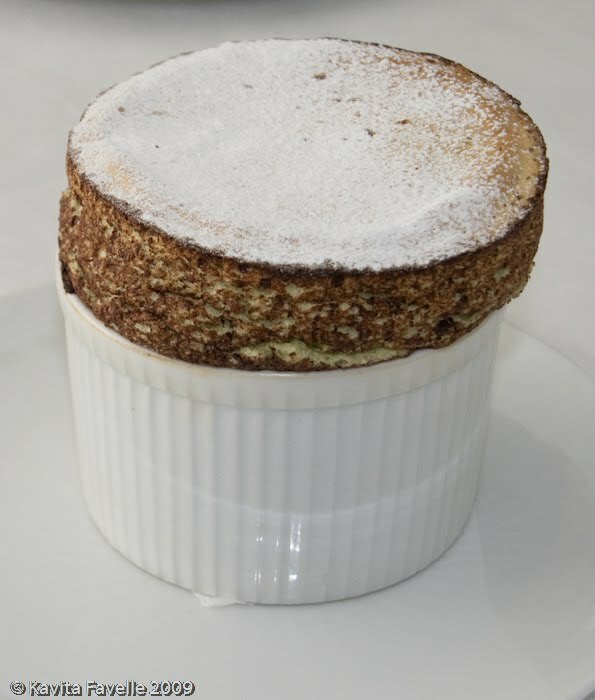 That “apple pie” looks out of this world – and the pistachio souffle -oohhhh- can you think of a way to reproduce something similar? I love your blog Kavey and your enthusiasm about food – thankyou so much. For £75 I wouldn't have been happy to have had to ask for petit fours. 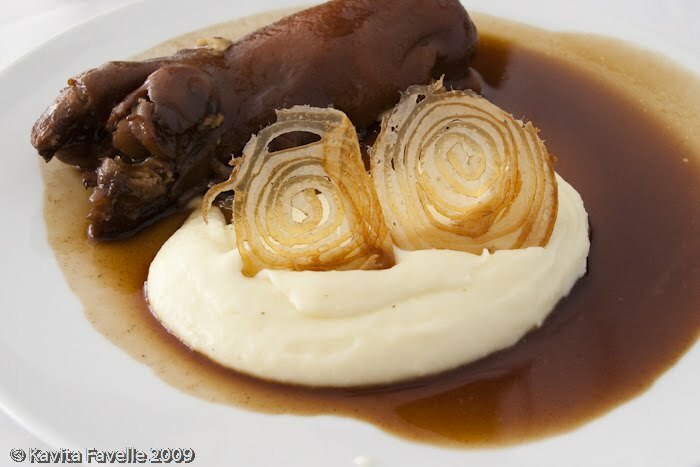 I am sad that I gave up my reservation as I would have dearly loved to try that pigs trotter, but that's the only thing that immediately jumped out of the menu for me. Anon, we didn't see any vegetarian options on the menu, perhaps one has to ask for them, I don't know. There are meat options and fish/ seafood ones but no purely veggies ones listed. 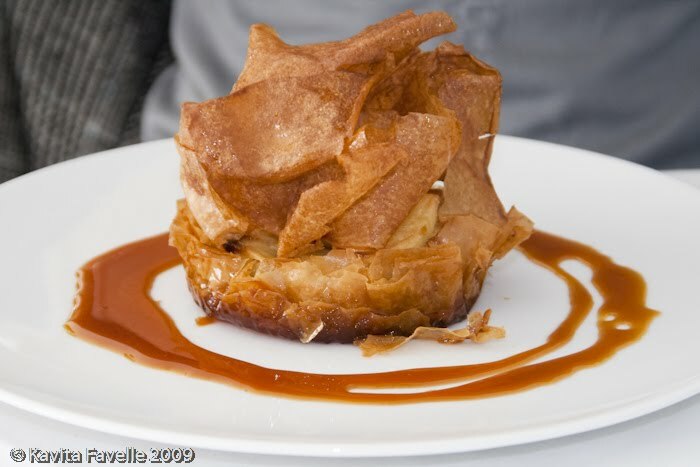 Anon, no idea on how to create that incredible Gascon apple pie, it was amazing! Lizzie, yes it was annoying, and service did become very haphazard towards the end. Depiste there being quite a few staff at the station, just next to our table, it was very hard to catch their eye without literally waving at them! I don't know why they forgot the petits fours, but as they were bringing out tea, they really oughtn't to have. We were very good, our drinks bill was <£5 for the wine and <£2 each for the mint tea. So about £80 bill + tenner tip. Yes, a little dear, but for me, worth it. I think it would have been nice to have maybe just one more complimentary course, perhaps a pre-dessert. But the petits fours, once we got them, were generous! Such a fabulous lunch! Thanks for letting me go with you! Your pictures are fantastic. How do you get them with the lovely borders? Good work on the speedy write-up! I've only vaguely heard about this from out here in the sticks, but might see what availability is like in the coming weeks now! Jen, no idea how the borders happen, it's part of my blogspot template / theme, I think! 🙂 Sorry! You're welcome, I really enjoyed the company, thank you! We just got back.Meal was nice but I think you had a better experience than us. They had run out of pigs trotters, they won't let us have a copy of the menu, weren't offered any bread or petit fours! Still we are glad we went and the duck & souffle were delicious! Thanks for getting a review up so quickly Kavey, great stuff. Can't wait to try it myself next week! It looks like an amazing experience, can't wait to go next week. Hope to meet Pierre over there and exchange some few words with him in French! I have very fond memories of La Tante Claire. While looking for wedding breakfast venues near Kensington & Chelsea Town Hall, we dropped in one Saturday morning and spoke to this very helpful man who couldn't have been nicer or given us more time or assistance. It was only when I flicked through the cookery book later, I realised it was Piere Koffman himself. The breakfast didn't come off but the engagement lunch was spectacular. Of for another stab at the trotter…! Wow, what an elegant meal. How excellent that you got to go there. What a fantastic write up! And your descriptions are gorgeous – spot on. Sounds like you had a marvellous experience…! Claire is indeed Pierre's wife, isn't she lovely? Sounds great, really looking forward to dinner Wednesday, wondering how it will vary from lunch. 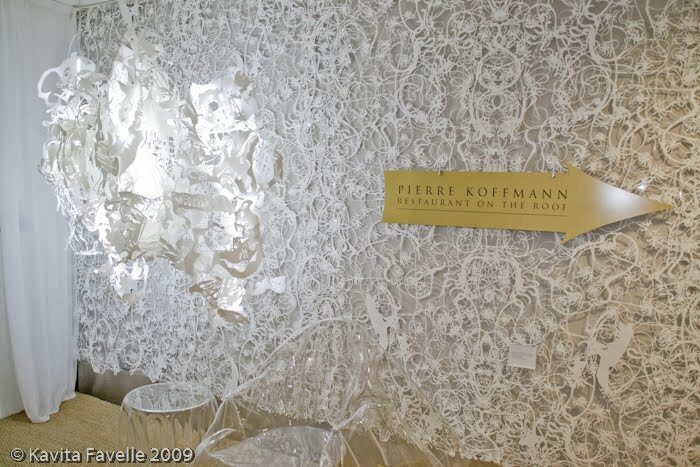 Really don't think we should jump to hard on the minor faults, the price for Koffman is amazing and it is a “pop up” after all! Thanks for such a fast and thorough review, I can't wait. We went for lunch on tuesday. It was possibly the best meal ever. Wow, what a great posting and wonderful pictures. I so definitely want to go now…. Thanks. That whole meal looks amazing! So nice to “meet” Mamta's daughter – I love her recipes! 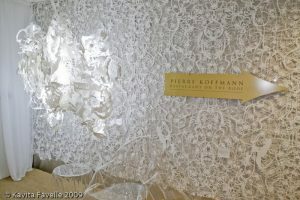 I went to Pierre Koffmann's place last night and loved it, thanks for the recommendation. I will be posting my thoughts on my blog soon. We had a couple of similar dishes – pig trotters and lobster cocktail. Your photography is amazing. Thanks again!! Great review Kavey and the photos of the food look superb. I'm sure the trotter tastes better than it looks. Its quiet the ugliest looking thing i have ever seen on a plate. You can quite clearly see the outline of where the toenails use to be. I think the plate needs a little more colour. Some vegetables of some description. I'm certainly considering the trot on my forthcoming visit.